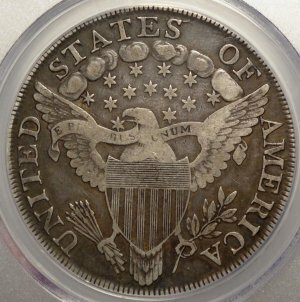 Early Draped Bust/Small Eagle Rev. 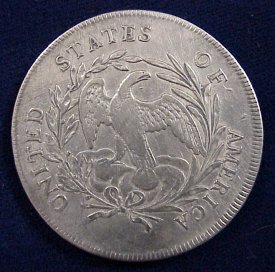 Dollar! 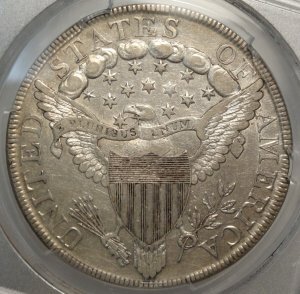 1795 U.S. Draped Bust silver dollar (PCGS CLND - AU details)...Variety: Small Eagle Reverse Cleaned long ago, here is a well balanced coin for detail and eye-appeal. A nice selection for your set. 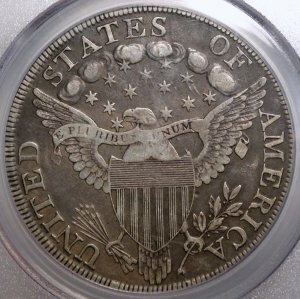 These are always in demand, very scarce, and becoming more expensive. 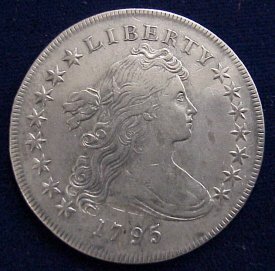 Affordable Early Draped Bust Silver Dollar! 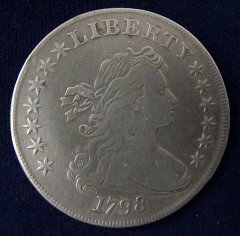 1798 U.S. Draped Bust silver dollar Fine (MJPM)...Variety: B-2; Large Eagle Reverse: Cleaned long ago making this an affordable example for your set! 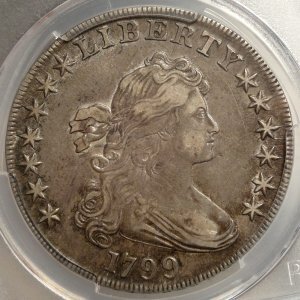 1798 U.S. Draped Bust silver dollar Genuine VF Details (PCGS)...VF35 details in our opinion - almost all of these early dollars have been cleaned at one time or another, however, we fully expected this coin to be graded VF35 or better. 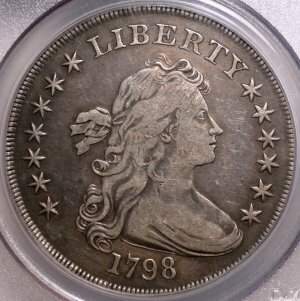 You be the judge, we have priced this accordingly for a terrific value for your type set. 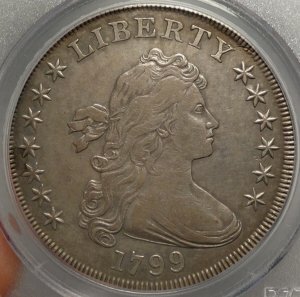 Nice deal on an early Draped Bust Dollar! 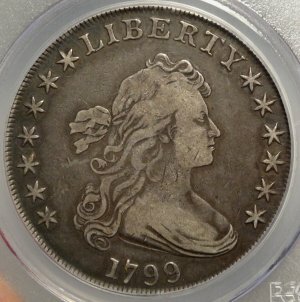 1799 U.S. Draped Bust silver dollar VF20 (PCGS)...Another problem free original early Draped Bust silver dollar from our collectors cabinet! 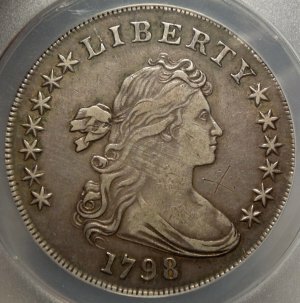 1799 U.S. Draped Bust silver dollar VF35 (PCGS)...Another beautiful early Draped Bust silver dollar from our collectors cabinet! 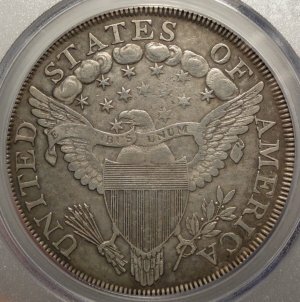 1799 U.S. Draped Bust silver dollar XF45 (PCGS)...A very nice original example of this popular type set date. 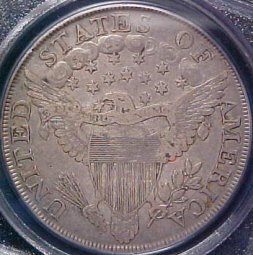 Our example shows above average mint luster for the grade on the obverse and reverse. 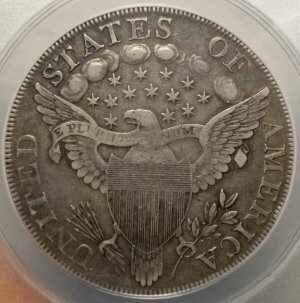 1800 U.S. Draped Bust silver dollar VF30 (PCGS)...This is the Early American Classic Draped Bust obverse and Heraldic Eagle Reverse Silver Dollar. 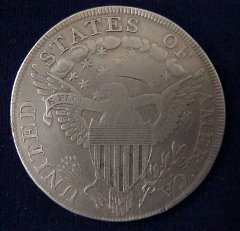 This early series of dollars are an excellent value at todays prices. 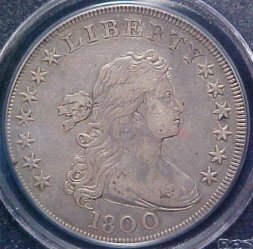 Our coin offered here represents a well centered specimen with decent color. As with most of these early dollars, it probably has been cleaned at one time. 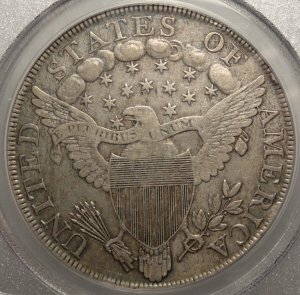 1800 U.S. Draped Bust silver dollar VF35 (PCGS)...Variety: Wide Date-Low 8 This is a nicely centered and well struck coin as denoted by the denticles 360 degrees around the planchet. 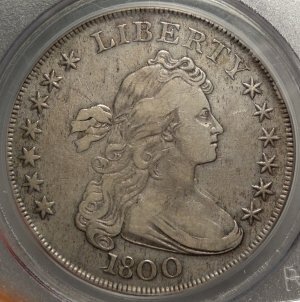 This will make a terrific addition to any set grading Fine to Almost Uncirculated.